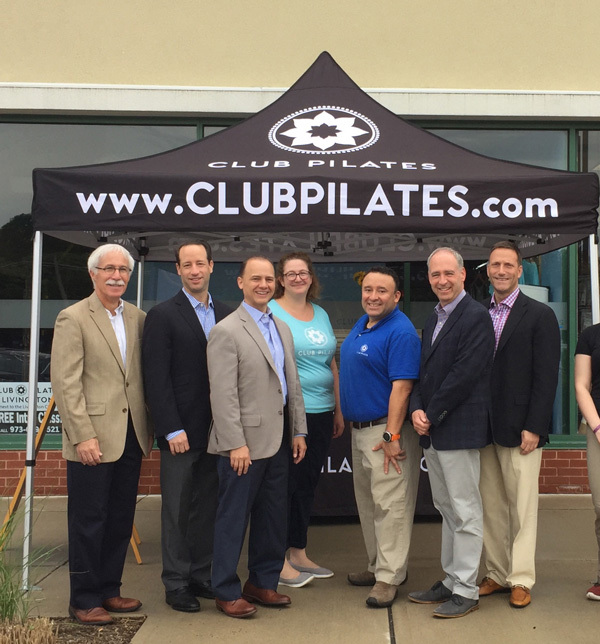 LIVINGSTON, N.J., – To mark its official grand opening at The Shoppes at the Livingston Circle, Club Pilates Livingston recently hosted a Ribbon Cutting Celebration to welcome in community members. This is the second Club Pilates location in N.J. owned by Arnold DeGarcia and Helen Angelis, who also operate Club Pilates Westfield. The Shoppes at the Livingston Circle is located at 277 Eisenhower Parkway in Livingston. The bright Club Pilates studio occupies approximately 1,730 square feet at the 93,000-square-foot shopping center, which is managed and developed by Eastman Companies. Florian Suserman of Ripco NJ, exclusive leasing agent for the property, represented both the tenant and landlord in this transaction. Pilates creates a strong foundation of balance, strength, mobility and flexibility. The full-body, low-impact workouts provide a high-impact challenge to the stabilizing muscles of the core. At Club Pilates, members choose from dozens of 50-minute group classes – each with a maximum of 12 participants – that utilize a variety of equipment, including reformers, EXO chairs, TRX, springboard and Barre. A number of membership packages and single session drop-in options are available. Founded in 2007, Club Pilates operates 350 studios around the U.S., bringing Pilates to hundreds of thousands of people. In 2016, Club Pilates served up over 2.2 million workouts to dedicated members. Situated at the intersection of Route 10 and Eisenhower Parkway, one of the region’s busiest retail corridors, The Shoppes at the Livingston Circle serves a residential population of more than 158,000 people within a five-mile radius. The center’s diverse tenant lineup offers a combination of national and local retail brands including Hand & Stone Massage and Facial Spa, Ike’s Bagel Café, Olive Garden, Choice Pet Supply, Wine Legend, M&T Bank and Zen Japanese Restaurant. In addition to Club Pilates, The Shoppes’ newest tenants include Mezza Mediterranean, Goldfish Swim School and CycleBar. Also opening soon at The Shoppes is Fitness 1440 and Moxi Blowdry & Beauty Bar. Aldi, the fast-growing supermarket chain, will open in early fall in the space formerly occupied by The Fresh Market.